I had someone ask me recently what a “cash account” was. They were under the impression that it was a temporary holding account for doing RRSP transfers between financial institutions, which is not the case. A “cash” or “non-registered” account is an account that is not tax-sheltered in any way. Any kind of income or capital gains will be taxed. Most people have chequeing or savings accounts which would be considered non-registered accounts. You can also have a non-registered or cash account at a brokerage where you could buy stocks or bonds. 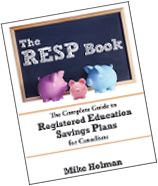 An RRSP account is considered a registered account. Contributions produce a tax receipt and withdrawals are considered taxable income. Any earnings inside the account are not taxable. If you withdraw money from your RRSP and put it into a non-registered account (or spend it), that withdrawal is considered taxable income. The money is no longer tax-sheltered. If you wish to transfer RRSP money to a new RRSP account at a different bank, you can do this without doing a taxable withdrawal by completing a T2033 RRSP transfer. Doing a T2033 RRSP transfer properly will ensure that you maintain the tax-sheltered status of your investment money. Step 1 is to set up an RRSP account at your new financial institution. Step 2 is to request a transfer from another institution. You will then be asked to fill in a T2033 form. You don’t have to notify or talk to your current advisor or institution. They will get the transfer request and will send the money along. Most of the form will be self-explanatory – generally you have to provide the account number and address of your existing financial institution. One section which is a bit trickier is the “in-kind” or “in-cash” transfer section. If you transfer your investments “in kind”, that means that you transfer your specific investments over to the new company without selling and buying. An example would be if you own 100 shares of BMO stock at Scotia iTrade online brokerage. You’ve decided to go with Questrade brokerage because you like the name better, so you tell Questrade to complete the transfer “in kind” because you don’t want to sell the BMO shares. You can only do an “in kind” transfer if the investment you own is available at both financial institutions. Most stocks for example, would be available at all brokerages whereas as a GIC purchased at a particular bank wouldn’t be offered anywhere else. Why do an in kind transfer? Taxes – No tax consequences resulting from selling your existing investments. This only applies to investments in a non-registered account. Cheaper – Some securities such as stocks cost money to buy and sell. Moving your investment “in cash” means your investments at your current brokerage will be sold and the resulting cash will be transferred to the new broker where you will then buy new investments. This also referred to as a “cash liquidation” transfer. If you ask for an ‘in-cash’ transfer, you don’t have to do the actual selling – your financial institution will handle that for you. Why do an ‘in cash’ transfer? Typically you would do an “in cash” transfer if your current investments are in-house investment products that are not sold at the new institution. An example might be a certificate of deposit or a mutual fund. For example you might own 3 mutual funds at fund company ABC – you decide you would rather invest with fund company XYZ, so you would do an “in cash” transfer – sell the ABC funds, move the cash, then buy your new funds at XYZ. Most institutions will charge a transfer-out fee is you move your account to a different company. They usually range from $125-$150 for stock account and can be as low as $50 for mutual fund accounts. Check with your current financial company to see if there will be a transfer-out fee. The way to avoid the transfer fee is to ask your new financial institution to cover the transfer fee. If you are moving a decent amount of money, then the odds are quite good they will pay it. It doesn’t hurt to ask! If you are moving registered money (ie RRSP,TFSA,RRIF) from one institution to another financial institution – you need to complete the proper transfer so that the government doesn’t think you have cashed in your account, which will have tax consequences. For RRSP accounts, doing a T2033 transfer will maintain the tax-sheltered status of the RRSP funds. Transfer in-kind means you are moving your existing investments to the new account. Transfer in-cash means you are selling the investments and moving the cash. Most companies charge transfer out fees – ask your new financial institution to pay it. For a detailed comparison of all the Canadian brokerages – check out my Canadian discount brokerage comparison. I have just read your article in regard to university tuition costs and find it quite amusing. Not once to you assert fact, instead it is all “your assumption”. Not good enough, and certainly poorly researched and written. This is just my opinion–just as this blog is the opinion of the author–the assumptions made were reasonable; you are entitled to present assumptions on your own blog. The critique was reasonable and gave food for thought about the projections created by the report authors. There are many different factors that affect the cost of tuition, including the discipline chosen, a local or away university (as Mike mentions), if government decides to return to pre 80s education subsidies, etc. Don’t forget with an RRSP transfer there’s likely to be a transfer fee (approx $100). Ask your new institution if they’ll reimburse you for this–some will depending on the value of the portfolio. @Leslie – Thanks, I completely forgot to mention the transfer fee. I’ll update the article. I would love to see a similar post on transferring RESP’s. Thanks very much, it was surprising how hard it was to find information on this. I hate the bureaucracy of these institutions, this stuff is a big fat hassle. Please give me the best advised.. I’m in debt and thinking to apply for bankrupcy. However I have RRSP . I’m afraid they will take from me if I will be in bankrupt .. I tried move my RRSP to another bank institution but they released the money as cash RRSP. Right now setting in my new bank institution..I don’t want to loose and taken away from me.. What should I do? I am in shock after transferring RRSP mutual funds “in Cash” There are a lot of surprises! DSC charges (I have been with that company and dealer for 12 years) , length of time my cashed out investments are sitting in cash, the brush off I got from the Mutual Fund Dealers complaint department. Please…..who else can I use rather than Mutual Fund Dealers! Your article on transfer in kind or cash was very helpful in understanding this. I have about 2 weeks ago instructed my new financial institution to request transfer of funds that were already cashed (all stocks sold). I signed all necessary forms at the new institution and they sent letter to my old institution on same day and also sent copies to them by fax. I am still waiting for the old institution to send the money to the new institution. Is there any regulation that specifies how long this process should take. It has already cost me over $1000 in lost interest. Your help is appreciated. 1] If segregated funds inside an RRSP account held at an Insurance company are sold and kept inside the RRSP, would there be any capital gains generated at the time of sale? 2] If there were no capital gains generated in example 1] and the funds were then transferred in-kind to another financial institution to a new RRSP account, would there be any tax consequences? Very good info. if you have Funds to move from IG to another institution as ALL IG funds have to be sold.